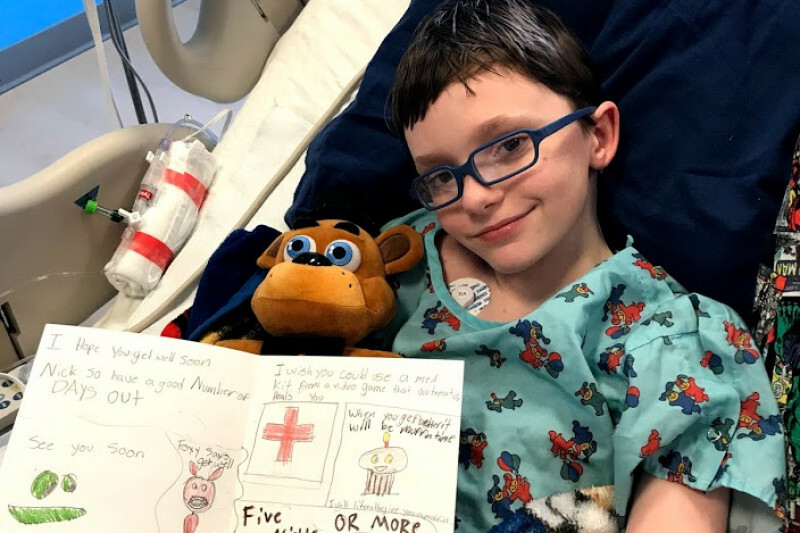 This GoFundMe Campaign will help support Chas and Michelle Argent as they oversee the recovery of their 12-year-old son, Nicolas, who suffered a hemorrhagic stroke on January 13, 2018. The stroke was caused by a medical condition called arteriovenous malformation (AVM), which was previously undiagnosed and that presented no symptoms whatsoever until the stroke. 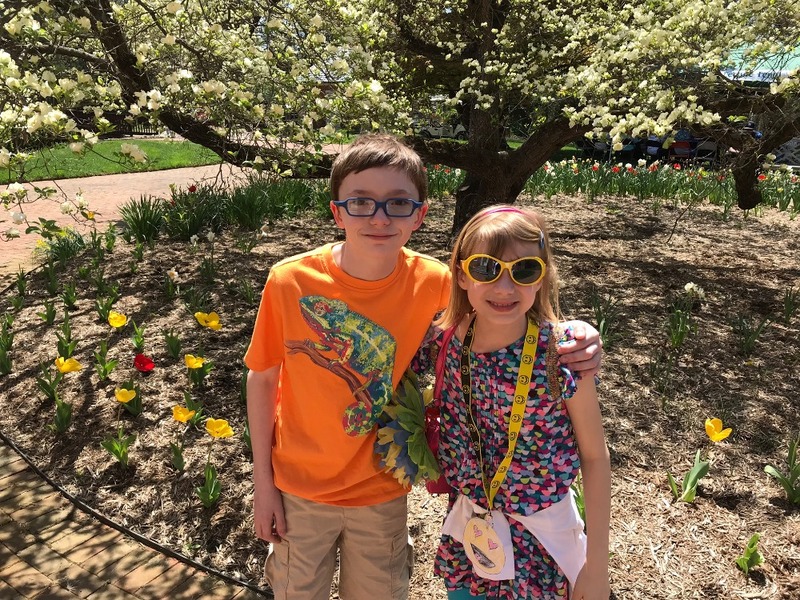 Nicolas survived this life-threatening event and after spending two weeks in the Pediatric Intensive Care Unit at The Johns Hopkins Hospital, he was thrilled to come home on January 27th to be with his family – including his 9-year-old sister, Bryn; his dog, Willow; and his cat, Poe. Nicolas continues to amaze and inspire those around him with his fighting spirit, his astounding recovery, and his ever-present smile. However, his journey is just beginning. 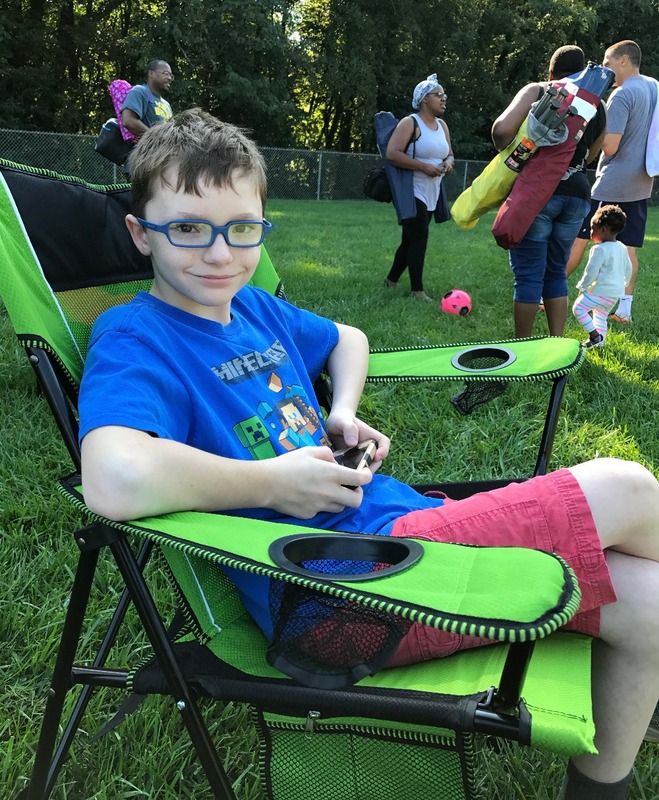 On January 29th, Nicolas began a comprehensive rehabilitation program at Kennedy Krieger Institute where he is receiving care from doctors, physical therapists, speech and language pathologists, occupational therapists, nurses, and neuropsychologists as he works towards transitioning back to middle school. It is currently anticipated that he will be receiving these intensive therapies for at least a few months. In the next 6 months or so, the Argents have been told that Nicolas will need to have surgery to correct the AVM condition in his brain that caused the stroke in the first place. Otherwise, it could happen again. It is not safe to do this procedure on Nicolas at this time. Further tests, treatments, and therapies will most likely follow. To care for Nicolas, Michelle has had to take an indefinite leave of absence without pay from her new career as a special educator. She just graduated with her M.Ed. in August and as a new employee, she does not qualify for the Family Medical Leave Act. For now, the family can keep health insurance under the school’s plan, but they have to pay the full, unsubsidized premium. The vast majority of Nicolas’ medical expenses are covered, but innumerable subsidiary expenses remain in the face of the significant loss of Michelle’s salary. The Argents are great people, and this campaign is intended to provide the many friends of the Argents with an easy way to help them out during this time of need. Donated funds will go to help defray Argent family expenses while Nicolas recovers. There is no doubt that they will be very grateful for any help. We are moving into a new phase of recovery for Nicolas and want to update all of you who have been kind enough to keep him in your thoughts and hearts. The wonderful news is that as of last month, all of the swelling in his brain has gone down! We were thrilled to receive this news as it meant that Nicolas was cleared to participate in all normal 13-year-old physical activities. He was very happy to get on his bike again! It also means that we can now focus on getting rid of the problem that caused his stroke in the first place, his AVM. 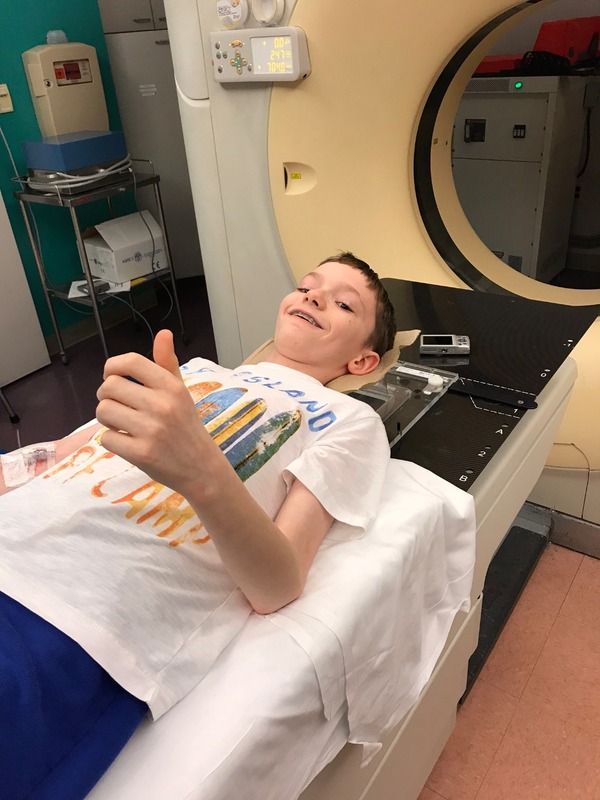 After exploring the different options with his neurosurgeons, Nicolas is going to have a treatment called stereotactic radiosurgery. It is a one-time treatment that will deliver a highly-targeted dose of radiation to the left frontal lobe of his brain in the hopes that over time it will cause the AVM to disintegrate. When they say “over time”…it is a relatively long time. We will have to wait 2-3 YEARS to learn if the procedure has been successful. So, the universe appears to want us to learn patience. As one might expect, anytime the brain is being treated directly, there are risks involved…but we aren’t going to spell them out here or give them any power. Instead, we are choosing to focus on the positives. The fact that Nicolas has surpassed all expectations and beat the odds so far gives us a great deal of hope going into the radiation treatment. There are medical procedures that have to take place in preparation for the treatment itself. 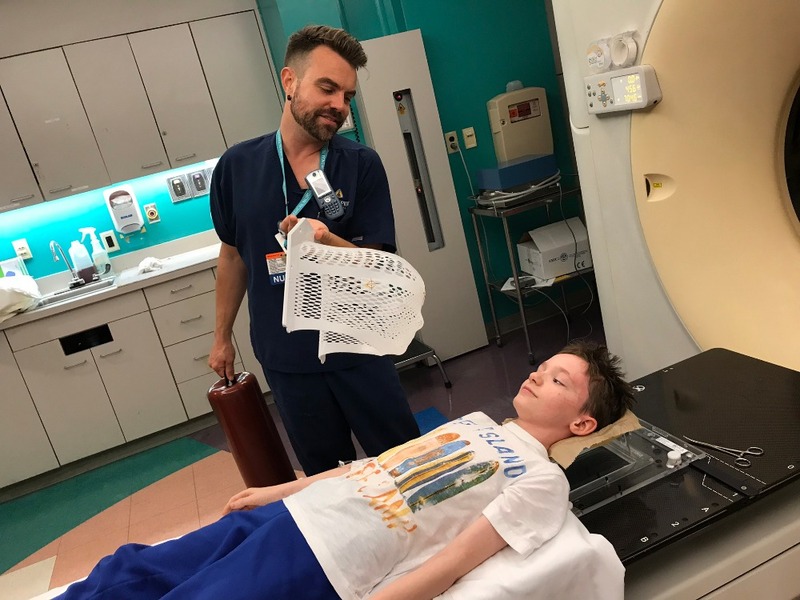 Last week, Nicolas went in for a “simulation day” where a molded mask (see photo) was made that will be used to keep his head perfectly in place during the radiation treatment. (It would be very bad if his head moved even the slightest amount during the radiation.) He also had CT scans and another MRI. Later this week he goes in for an angiogram. While an angiogram is a surgery in itself, we expect him to return home that evening. All of these procedures are geared at getting as many images of the brain, from as many different positions, as possible so that the AVM can be targeted incredibly precisely. Then a neurosurgeon, a radiation oncologist, and a physicist will spend a couple of weeks working both independently and together to plan every aspect of the radiation treatment and then program it into the cyber knife computer. Nicolas will have the stereotactic radiosurgery on June 26th. We are so grateful for the emotional support that all of you have offered our family. We ask that you continue to keep Nicolas in your thoughts over the next few years. One aspect of the radiation treatment is that the risk of having another stroke doubles from the time the treatment is performed to the time the AVM is disintegrated, 2-3 years later. For that reason, your continued prayers would mean a great deal to our family. We believe that Nicolas is strong, and we have faith that he will not only survive, but that he will go on to thrive! Nicolas has had quite a week and we want you to share in the good news. 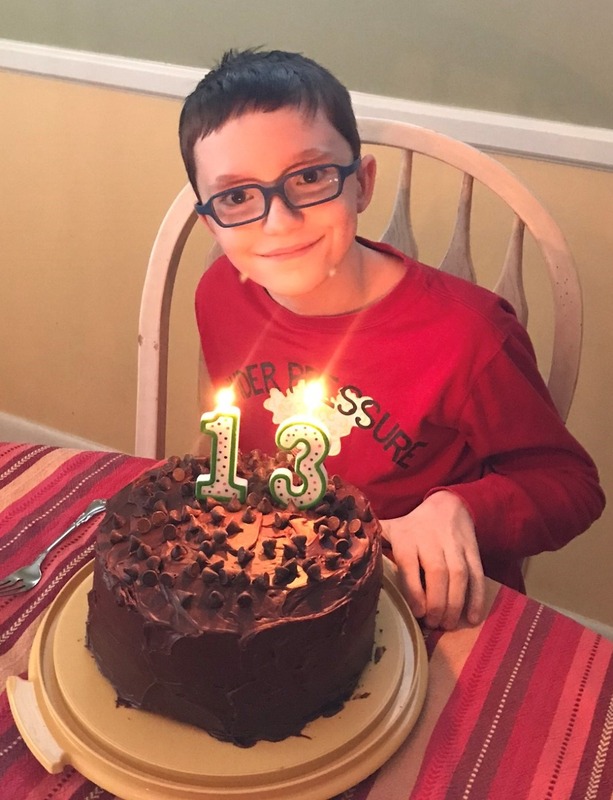 On March 9th, Nicolas celebrated his 13th birthday! It was a particularly special birthday for us, as there were a few times in the past couple of months when we weren’t sure if he would make it to his 13th year. So, turning 13 was definitely cause for great joy! 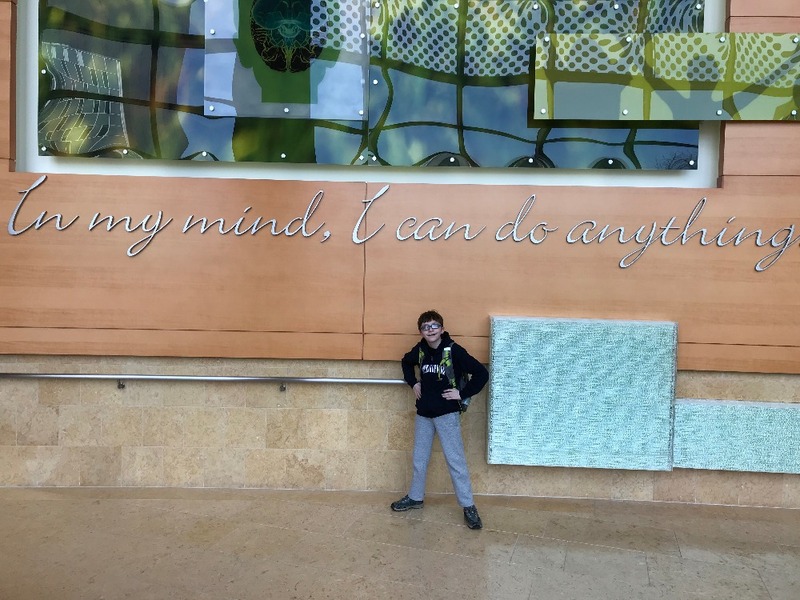 However, as if that weren’t enough, Nicolas achieved another huge milestone on March 9th…he had his final day in the outpatient rehab program at Kennedy Krieger! After 6 weeks in the program, Nicolas became a graduate! He worked incredibly hard while he was there, and he takes great pride in the fact that he achieved his goals. Frankly, he surprised us and the therapists! Nicolas will be testing the waters at his middle school again beginning tomorrow! He will start back to school with ½ days, and then move into full days by the end of the week, and then we’ll assess how it is going. Nicolas will continue to have ongoing follow-ups with his neurosurgeon, and eventually surgery to correct his AVM. But in the meantime, he is VERY excited to return to school, see his friends, and begin to feel like a typical 7th grader again. Thank you all for your support! We are so pleased to share the news of this landmark as he continues on the path to recovery. Nicolas continues to amaze us with his progress. He is in his 4th week at Kennedy Krieger Institute and he grows stronger each day! He is walking solidly (most would not even notice a right side drag any longer), dressing himself, eating and swallowing, going up and down stairs, and speaking more and more clearly with each passing day. We continue to work on building up the strength on his right side, as well as his cognitive skills. In the meantime, he is full of joy. 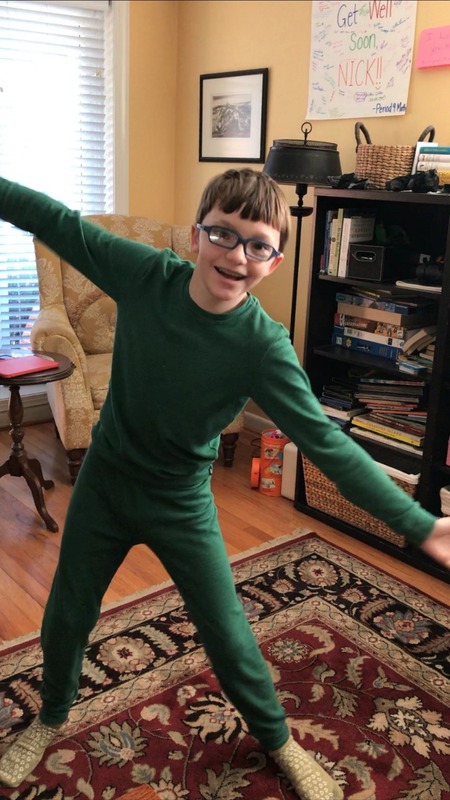 He dances in the living room regularly, he plays on his Xbox One (yes - he CAN work the controller), and he listens to his favorite comedian, Jim Gaffigan, every day! When we were in the pediatric intensive care unit, we saw so many children in great physical pain. We are incredibly grateful that Nicolas is not currently experiencing any pain. Thank you again for all of the positive energy you have sent our way. It is a powerful feeling to sit in an intensive care unit, or a rehab center, or a neurosurgeon's office, and not feel alone in your journey…but instead to feel an army of human beings supporting you. We wish that all people facing challenges in their lives could experience what you have given us these past several weeks. If they did, the world would be a different place. It is truly life-altering! Over two-thirds of the way to goal in ten days! That’s pretty great. Again, this is a testament to the high regard in which Nico and the Argents are held. I know how grateful the entire family is for each and donation and for all your love. Luckily, Nico continues to improve under his course of intensive therapy. The majority of donations are $100 or less, and those have quickly added up to get the campaign as far as it has. I know that some people have donated more than once. (I encourage it!) Others have helped immensely by “sharing” the campaign among their friends, and spreading the word is very important. There is no question, however, that some especially generous donators have also made a big impact, and I am taking a moment to single out some, although others have requested to remain anonymous. As always in these campaigns, the last $$ are toughest, as people most interested in the campaign have mostly already donated. I am going to wait till later to encourage people to donate a second time, but in the meantime, please be sure that you have shared this campaign with everyone you think may be interested.